Humber College Creates a Global-Ready Student Community - SchoolFinder.com! Studying at Humber College in Toronto puts you on the pathway for success. Canada is an increasingly popular destination for international students seeking the quality of a North American postsecondary education. With a population of more than 35 million and over 100 cultures represented, it’s a dynamic and exciting place to study, live, and work. Nestled close to the US border, Toronto is the economic and cultural centre of the country - it’s where the best and brightest come to make their mark. 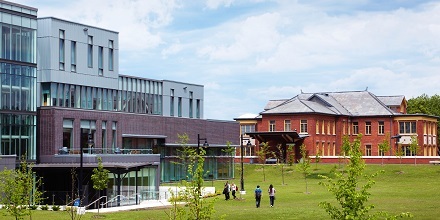 Located in Toronto, Humber College, is a leader in public postsecondary education in Canada, providing a learning environment for students who are excited by innovation and creative thinking and are entrepreneurial, adventurous, and talented. Humber has eight schools of study, including Applied Technology; Business; Creative & Performing Arts; Health Sciences; Hospitality; Recreation & Tourism; Liberal Arts & Sciences; Media Studies & Information Technology; and Social & Community Services. With more than 170 Bachelor’s degrees, diplomas and postgraduate certificates, Humber’s range of programs have been developed by experts from education and industry and offer a blend of theory and practical experience. Over 3,000 international students from more than 130 countries study at Humber each year. Whether entering Humber directly from high school, previous studies, or after working, Humber is committed to student success, creating pathways that can lead to a variety of successful career opportunities. Humber students and graduates have made outstanding achievements in all walks of industry. Humber’s employer satisfaction rate is 93% - higher than the Greater Toronto Area and provincial average. Global experience is invaluable in today’s interconnected world. Humber is committed to creating a global-ready community of students through the provision of diverse perspectives and opportunities that support development of the broad range of skills, values, and competencies sought by society and employers. For more information about opportunities at Humber, visit international.humber.ca.